So you think that you may want to try using in flight power? Good choice. It is not guaranteed you’re plane will have it, and the airlines have been known at times to not turn it on in-flight (despite passengers asking nicely that the switch be flipped on the flight-attendents panel). There are a few options for using in-seat power, but the most common option is EmPower. Obviously if your plane has standard electrical outlets (which exists almost exclusively on non-US carriers at the moment) you don’t need a device to convert your power. If your plane uses a cigarette outlet (only American Airlines uses this option throughout it’s fleet) you can also use your EmPower device, as almost all EmPower power supplies have a cigarette tip included it in the design of the . Having tried many different inverters ininverter flight I currently have three and really only choose to use one in-flight. My choice to stick primarily with one unit is based on not only size and flexibility of the unit, but it’s reliability, size and ruggedness. 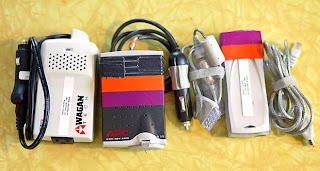 The three devices I have are the following: Wagen Tech 120 watt car/airline inverter(white on left) APC 75 watt car/airline inverter (grey in center) and the iGo Juice 70 (silver on right). By looking at the photo you can probably tell which two travel the most and really tell which one is my unit of choice. All three devices are between $90 and $130, although prices may vary. All three devices do their job, but I’ll weed out why I currently choose not to use one device on airplanes, and only use it in my car. The Wagan Tech 120 watt is a nice unit. For size and ergonomics it cannot be beat. I bought this inverter to replace my older, and heavily beaten, APC 75 watt inverter. When the box arrived I popped open the packages, plugged it into the cigarette outlet in my car and tested it out a little bit. Satisfied that the unit would fit my packing needs and handle what I wanted it to charge I promptly packed it up for a four journey that would involved nine flights through four countries, two continents and a number of long haul flights. Of these flight six of the planes should have had EmPower installed in the seats for in-flight power (Korean Airlines 772, Korean Airlines 747-E on two flights, Continental/Microneasian Airlines 764, Delta 764, Delta 738) ……of these planes the Wagan Tech inverter fit exactly ZERO of the EmPower outlets, despite the company selling it as an EmPower device (keep in mind that EmPower is a standard system, there are no “different versions” of EmPower). I contacted Wagan Tech when I got home as I spent around 40 hours in flight in four days with no way to use my laptop , the answer the company’s customer service gave me was “you must have been using it wrong.” I was ticked off, but it works in my car, so I am keeping it for my car. On to the two devices I use……for Laptop and Mobile Phone charging I love the iGo 70. The iGo unit is made up of multiple pieces. The main power “box” the power cord with interchangable tips that conform to all sorts of different computers, the “power cord” (there are two) and that’s it. If you want you can plug in an auxiliary cord that will simultaneously charge your mobile phone. 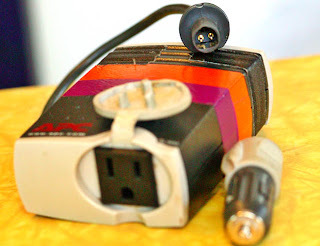 The beauty of the iGo is that you can use it to power your laptop at home in an AC outlet (and the iGo comes with a global plug set so it can be used around the world!) , it also comes with a DC power cord that will work in your car as well as in an airplane EmPower outlet. If you do not plan on charging anything else, besides your laptop and phone (and iPod, which you charge by plugging into your laptop) then the iGo is fantastic. I love mine. I always carry two spare power tips for the laptop and phone incase I lose to break a tip….but at $10 a tip it’s not a big deal. Overall the iGo is a fantastic device and should be looked into, because they make many versions for different uses, by anyone who owns a laptop and uses it at any point off of their desk. Now the work horse of my traveling power…..the APC 75 Watt DC/AC inverter with EmPower. This model was updated to a 90 watt unit and again, recently to a compact 150 watt unit! My APC inverter is fantastic, it is a an absolute work horse, it takes a beating and it just keeps on working. This unit is great because it is compact, it has a standard North American three-prong outlet, emits low heat and transfers from my plane seat to my rental car front seat , usually with a small three outlet adapter, to power my laptop and batter chargers. The unit is simple and easy to use. Green light means power, red light means low power, no light means it ain’t plugged into a source with any power. There are other options from companies like Kingston and Targus, as well as a few others, but none of them lasted or impressed me for a variety of reasons. Top of the list is primarily size and weight.